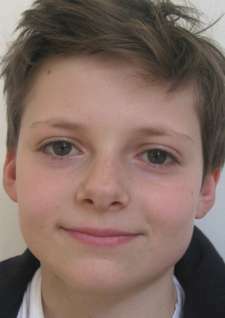 Louis Ashbourne Serkis (born June 19, 2004) is an British actor from London England. He is famous his role as Bhoot in Netflix's Mowgli: Legend of the Jungle. He began his career in 2016 with Alice Through the Looking Glass and had a small part inThe Lord of the Rings, The Hobbit: An Unexpected Journey (2012). Currently he's in the just released The Kid Who Would Be King alongside Tom Taylor, playing Alex Elliot, a kid who inherits the sword Excalibur. Acting runs in the family for Louis Ashbourne Serkis. The 14-year-old son of actors Andy Serkis and Lorraine Ashbourne and is already quite comfortable in front of the camera, but as he told ET during a Monday interview at FAO Schwarz in Rockefeller Center, he still looked to his parents for their expert advice on set. "[My dad] came down quite a lot, supporting me, watching me [and] told me I was doing all right," he said. "[But the best advice he gave me was] 'Don't look into the camera.'" The Lord of the Rings star's son is clearly a quick learner -- and doing his parents proud. "I'm just extraordinarily proud. Seeing him go through all the work, the training, the buildup and then the filming," said Serkis, who shares two other children with Ashbourne. "All my kids are just growing up. We try and keep things normal when we're at home, but it's very special to have them see things going on. They're experiencing traveling and seeing the world... having their experiences broadened. It's great." Louis worked with his dad on Netflix's Mowgli: Legend of the Jungle, voicing the character Bhoot, but The Kid Who Would Be King is all about him. Louis' character, Alex, is picked on in the movie until he finds and pulls King Arthur's sword, Excalibur, and must stop an ancient villain and save the world. "It's very exciting," Louis raved of the movie. "With all social media and bullying, I think it's important that we spread the message of love, no division, and just be happier... if you're getting bullied, then just let someone know." The child actor has clearly been taught well. When asked who his personal hero is, he answered Michelle Obama. "I think she's very empowering. She's great," he shared. Louis' also got a lot of respect for his dad. "I mean, having him as an actor, you know, if I need to come to him for anything, or if I am nervous, he will reassure me," he said. As for what Louis will be spending his first big paycheck on, Serkis joked it's about time he starts taking care of his parents. "[The money's] not for himself. It's what he's going to buy for us," he said with a laugh.